There are several types of fire protection systems available when it comes to protecting your home, business, and or assets. 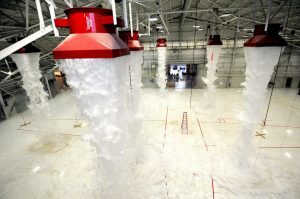 There are wet systems, dry systems, fire sprinkler systems, fire suppression systems, and many more. Two systems that are similar but have a distinct difference are the deluge system and the pre-action system. Both are a type of dry fire protection system. They can be used in cold weather applications and used for a variety of businesses and applications. A deluge system is a dry fire protection system that the piping for the system is empty and at atmospheric pressure with the sprinkler heads all open. When the system detects heat and or fire, the deluge valve will release water, dry chemicals, inert gases, or foam depending on the type of system for the hazard and location being protected. It will then flood the system and will be released by all sprinkler heads simultaneously. This system is generally used when an entire area needs to be protected immediately instead of by zone or location of source of heat or fire. This system is used most typically for airport hangars, chemical plants, processing plants, data storage units, chemical plants, and many more of the same type. A pre-action system is hybrid a dry/wet fire protection system. The difference between a deluge system and the pre-action system is that in the pre-action system, the pipes are filled with compressed air and the sprinkler heads are all closed. This way the system is considered a dry system until activated when it becomes a wet system. When the system detects heat and or fire it is flooded with water, dry chemicals, inert gases, or foam. When a specific sprinkler head detects heat or fire, that sprinkler head will open and the system will work to extinguish the fire in that immediate area. As more sprinkler heads become activated, the systems coverage will expand. These types of systems are also used when accidental discharge of extinguishant could be detrimental. Pre-action system is commonly used in museums, art galleries, data centers, libraries and the like. These types of systems are used in cold weather applications where water could freeze in the pipes and the system would be damaged. They are typically used in high hazard areas and also areas where you want to protect highly sensitive objects. When choosing a fire protection system, a fire protection company will be able to help you distinguish what type of system works best for your application. They will work with you to make sure that the type of system you need to install will meet the building codes set by the NFPA, your insurance company, and or the Authority Having Jurisdiction(AHJ) for your area.